We all have a certain emotional attachment not only to other humans that we love but also to our laptops and cars. Some of us may spend more money on your precious computing gear then on loved ones. That’s how passionate we are about our everyday technology. Technology helps us to make our lives brighter, happier and allows us to enjoy life "after work". So, when it comes time to get a new one you can imagine just how devastating and traumatic it is to say good-bye to it. There is hope for our aging gaming laptop though. And it comes in the form of an MXM module. We recently revitalized an aging Alienware M17x R3 from the brink of extinction by upgrading the default GPU (an NVIDIA GeForce GTX 580M) with the NVIDIA GeForce GTX 780M and GTX 880M. The result was almost immediate. It felt just like the day that I bought it new from the store. I was overcome with such joy and excitement. I brought an old laptop top back from its virtual deathbed. It was able to play Call of Duty Black Ops © on a machine which was discontinued in 2012. The benefit of using standard MXM 3.0b GPU modules in laptops is to create an industry standard slot so that users can easily upgrade the graphics processor in their laptops, without having to buy a new system. And most of all saving you money in the process, keeping your old laptop and its components out of our landfills and extending your old but loved gaming computer’s life span. To get an accurate sense of how much better it preformed over the GTX 580M I ran the standard benchmark stress tests. 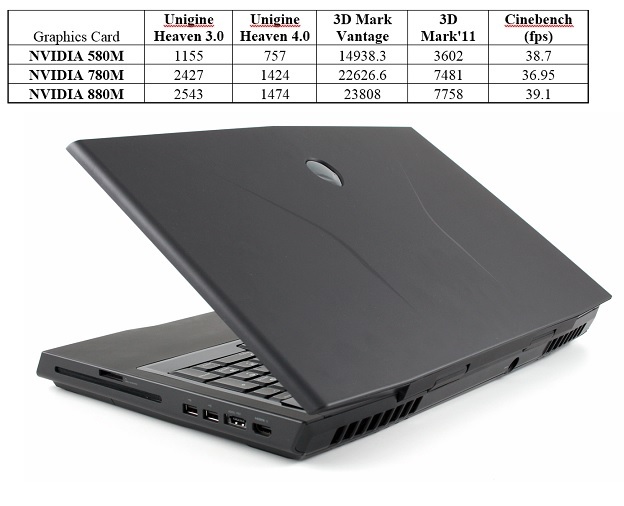 (Unigine 3.0, Unigine 4.0, 3D Mark Vantage, 3D Mark 11 and CineBench). On average there was a 40% to 55% increase with the GTX 880M or GTX 780M compared to the GTX 580M. So save your time and money. And keep your laptop for a few more years. Love Your Laptop!